Happy Easter Sunday to all my religious and secular friends alike! Jon and I are firmly (oh so firmly) on the non-religious side of things, but that didn’t stop us from surprising each other with little treats this morning for the fun of it. He gave me a Lindt chocolate bunny and I forced him to stay shut up in the bathroom this morning while I hid Cadbury cream eggs throughout our tiny apartment. A much better use of our time than being one of those people that only go to church at Christmas and Easter, right? 😉 I kid I kid, do as you like. No, but seriously, that was a running joke in our family in the older, regular church-going days. Services are poppin on Easter and you know you won’t see 80% of those people again until December. At least the “Easter dress” is a thing. Speaking of, we’re having a nice Easter meal tomorrow with Jon’s parents and grandparents, and I will definitely be taking advantage of the chance to wear a nice dress, as God intended! 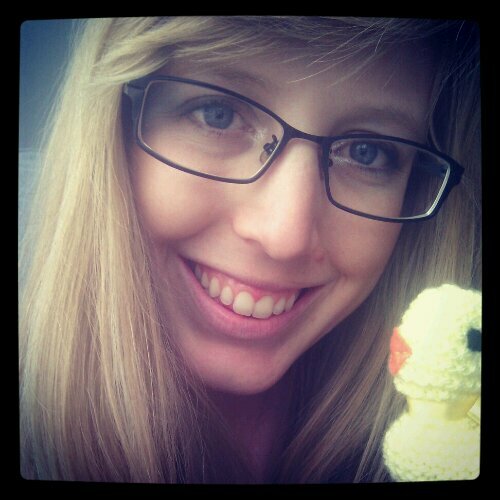 I also picked up a hand-knit ducky at a craft fair we came across yesterday. It is actually a chocolate egg cozy! So twee it makes my teeth hurt. But it was less than 2 bucks-of course I bought it. I hid one of Jon’s eggs in the duck cozy in the coffee pot. He thought that was on the macabre side of things. Poor ducky. Another one on the windowsill. Don’t worry, the curtains were closed, so it wasn’t this obvious. My hiding skills are better than that. The pièce de résistance: in the wok on the rack by the stove, hidden by bread. 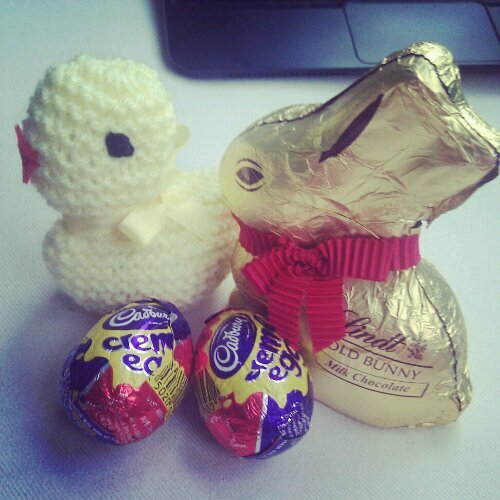 *Bows* Easter is fun. I was talking to my dad via a quick facebook chat the other day and reminded him of the one Easter of my childhood that he and my step-mom hid mine and my sister’s baskets in the oven (it wasn’t on, of course). It was impressive. I believe there was another one where they were discovered in the shower maybe? Jon says that his family never really did the whole “basket” thing when they were young, but that they always got a giant chocolate egg. Yet another American/English difference to add to the list. Now I’m off to continue our day of eating too much and catching up on tv. Because the UK government “gives” everyone Good Friday off, as well as the Monday after Easter Sunday as a bank holiday, Jon’s in the midst of a four day weekend! Pretty cool huh? It brings up issues of religious preference in supposedly non-religious governments/countries, but let’s not talk about that now and instead just enjoy the long weekend for everybody, even the heathens sucking down chocolate instead of praying *coughcough*. Mom, I said “family” of which you are a part. Calm down. Hope you feel better. Love you.